The American Baptist church originated in British North America as "little tabernacles in the wilderness," isolated seventeenth-century congregations that had grown into a mainstream denomination by the early nineteenth century. The common view of this transition casts these evangelicals as radicals who were on society's fringe during the colonial period, only to become conservative by the nineteenth century after they had achieved social acceptance. In Bodies of Belief, Janet Moore Lindman challenges this accepted, if oversimplified, characterization of early American Baptists by arguing that they struggled with issues of equity and power within the church during the colonial period, and that evangelical religion was both radical and conservative from its beginning. 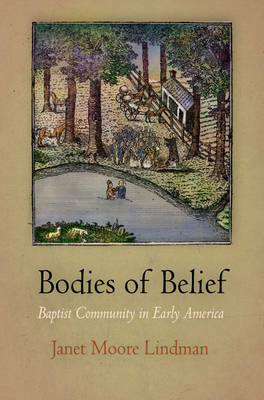 Bodies of Belief traces the paradoxical evolution of the Baptist religion, including the struggles of early settlement and church building, the varieties of theology and worship, and the multivalent meaning of conversation, ritual, and godly community. Lindman demonstrates how the body-both individual bodies and the collective body of believers-was central to the Baptist definition and maintenance of faith. The Baptist religion galvanized believers through a visceral transformation of religious conversion, which was then maintained through ritual. Yet the Baptist body was differentiated by race and gender. Although all believers were spiritual equals, white men remained at the top of a rigid church hierarchy. Drawing on church books, associational records, diaries, letters, sermon notes, ministerial accounts, and early histories from the mid-Atlantic and the Chesapeake as well as New England, this innovative study of early American religion asserts that the Baptist religion was predicated simultaneously on a radical spiritual ethos and a conservative social outlook.